» What's the Matter With Kansas (Football)? What's the Matter With Kansas (Football)? As it turned out, fall would be just as unpleasant. “Well, let’s see,” Weis said in Lawrence last month, offering a survey of his first season on the job before his second one was about to begin. “We blew the Rice game: They kicked a field goal at the end. Then TCU turns it over six [Editor’s note: It was actually four] times but we still can’t beat ’em. Then we go to Northern Illinois and blow that lead. And let’s not talk about Texas Tech in double overtime. Or, while we’re at it, blowing the Okie State game when we got it cut to six and the ball’s on the 30-yard line. And how about giving up a touchdown pass to Texas with 11 seconds to go?” Kansas won just a single game, against South Dakota State. The program was so desperate for good news that the athletic department’s website briefly listed Blue’s win over White in the annual spring game as the team’s second victory of the season. It was 85 degrees in Lawrence during the year’s first practice with full pads, and Weis walked onto the field without a cane but still with a noticeable limp. 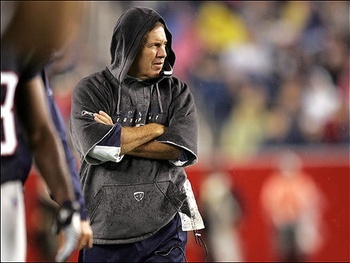 He wore a gray hoodie, not unlike his old boss. (Unlike Bill Belichick, Weis left the sleeves uncut.) “I feel like I’m living in San Diego,” he said, walking over to one sideline to greet Aaron Glenn, a three-time Pro Bowl cornerback who played for the Jets in the ’90s, when Weis was the team’s offensive coordinator. Glenn is now a Jets scout, covering colleges from Texas to the Dakotas. “I’m not looking at anyone in particular,” Glenn said, when I asked which Jayhawks he had his eyes on. He might have been keeping his cards close, but he might have simply been telling the truth: There are no Jayhawks on Mel Kiper Jr.’s Big Board. Glenn did say that, based on his experience, Kansas was lucky to have Weis. “He’s blunt, so you always know where you stand,” Glenn said. Nine years after he left the New England Patriots, Weis is clearly thankful to be free from Belichick’s media gag order. His first press conference in Lawrence this summer lasted more than an hour, with 20 minutes devoted to assessing his team’s entire depth chart in minute detail. “Last year at this time, I had a tough time giving you two deep — and I probably had a tough time giving you one deep in some cases,” he said. “We were awful at a lot of positions. We were awful at head coach, if you’re wondering.” Weis never once looked at a printout in front of him, as if to prove mastery of a lineup that had been transformed since he arrived. Weis was “really high on” just about everyone on the roster. This suggested either boundless optimism or desperation, depending on how you view the fact that he made a special note of exactly how high he was on the kid listed third on the depth chart at long-snapper. If you didn’t know already, you can now probably guess that Weis was born in New Jersey. His father, briefly a minor league baseball player, built a whiffle ball field in the family’s backyard, complete with foul poles and a pitcher’s mound. (Balls hit into the pool were ground-rule doubles.) Weis played just one year of high school football, at backup center, but fared much better on the diamond, where he was a starting catcher. After four years as a graduate assistant at the University of South Carolina, Weis returned to New Jersey, where he led Franklin High School to a 10-1 record. That was good enough to earn a call from Bill Parcells — Weis thought it was a prank — offering an entry-level job with the Giants. Weis spent eight of the next 10 years following the Tuna from New York to New England and back again, before Parcells retired and Weis followed Belichick back to the Patriots. Weis has been through so much subsequent tumult in his career that it is easy to forget he was once the offensive savant drawing up plays for Tom Brady. Time has only made it more difficult to divvy up credit for the Patriots’ early-2000s success. While the offense has not struggled in Weis’s absence, Brady and Belichick have yet to win another Super Bowl since Weis left. As the Patriots’ legend soared, Weis’s did, too, and he started shopping around for head coaching jobs, especially in his home state: He went so far as to call local reporters in New Jersey, asking if they might mention him as a candidate for the head coaching position at Rutgers, and in 2004, Weis made public his interest in replacing Jim Fassel with the Giants. “I thought I nailed those interviews,” Weis said at the time, openly disappointed that he was passed over for several NFL jobs. He exacted revenge by helping New England to its third Super Bowl title in four years. Weis was the highest-paid assistant coach in Florida history, and for a moment it seemed the investment might pay off. John Brantley, the team’s quarterback and a traditional pocket passer, had been planning to leave Florida if he had to play another season in Urban Meyer’s Tebow-oriented offense, but Brantley was convinced to return when the Gators hired Weis. Weis’s scheme and Brantley’s arm helped Florida score 30 points in each of its first four games. All was well through the first play of the team’s fifth game, against no. 3 Alabama, when Brantley threw a 65-yard touchdown. That makes Snyder’s subsequent performance all the more impressive: Since 1993, he has finished with a winning record in all but two of his 17 seasons as head coach, turning Kansas State into one of the most consistently above-average and occasionally excellent football programs in the country. The Wildcats play in Bill Snyder Family Football Stadium, outside which stands a statue of Snyder, making him one of just two active coaches able to shake a cast of his own hand while walking to work. (Alabama’s Nick Saban is the other.) He is revered in Manhattan to a degree reserved in Lawrence for whomever happens to be the Jayhawks men’s basketball coach at the time. Among the difficulties Snyder faced in turning around the Wildcats was the fact that Kansas produces fewer top-flight recruits than practically any other state with more than five Electoral College votes. A 1981 study commissioned by the NCAA found that Kansas had fewer high school football players available relative to the state’s 30 college teams than any other state in the country. This year, not a single member of Rivals’s top 250 high school recruits came from the state. The face of Weis’s transfer infusion is Marquel Combs, a top-three junior college recruit, who chose Kansas over offers from South Carolina, Texas A&M, and, of course, Kansas State. Combs spent two years at Pierce College in Los Angeles, and living near Hollywood seems to have increased his desire for the limelight. A 290-pound defensive end, he has declared himself a member of the fictional PRAA (Pass-Rushers Association of America), and he says that one of his primary motivations in picking a place to play football was access to good food. Inside a function room at Anderson Family Football Complex, on a day in which Weis was trotting out his juco recruits for local reporters, most of the players were allowed to leave early because of lack of media interest, but Combs had a dozen reporters at his table. He said that when the coaches told him that he had been talking too much, on Twitter and elsewhere, he bought a yo-yo, because it was difficult for him to talk and yo-yo at the same time. Having come from two universities where football knows little competition, Weis claims to have no complaints about the secondary place football occupies at Kansas. “The stadium needs work” is as close as he’ll come to a complaint, and it’s one that won’t last long, since an upgrade is already in the offing. “Look, when KU basketball is on national TV, there’s the Jayhawk,” Tim Grunhard, Weis’s offensive line coach told me. “It’s a positive for both programs.” Weis has learned to take advantage of the sport’s second-class status as best he can: In April, when he saw a preliminary basketball schedule, he suggested to Zenger, the athletic director, that the department schedule more home basketball games on recruiting weekends. One morning, after football practice, killing time before a scheduled meeting with Zenger, I walked to the university’s athletic hall of fame inside Allen Fieldhouse and stumbled upon the university’s annual Select-A-Seat program, which allowed donors of significant-enough largesse to choose their seats for the upcoming men’s basketball season. There were two rows of tables topped with laminated seating charts, and from 8 a.m. to 7 p.m., for an entire week, 10 donors were being brought through every 15 minutes. “It’s the Wiggins effect, or whatever you want to call it,” one KU employee said, mentioning that demand had been so high as a result of incoming super-freshman Andrew Wiggins’s imminent arrival that several hundred donors might not be able to get tickets. The university holds a similar event for football every spring, but there is far less fanfare, and the unofficial ticketing policy in recent years has been simple: “Please come!” While the basketball team has a sellout streak at 197 and counting, Memorial Stadium has not come close to one since 2009. Zenger, who worked with Snyder at Kansas State, was once the publisher of American Football Quarterly, an instructional magazine directed at coaches. He called the magazine, which he helped found, a “total start-up,” not unlike his task with Kansas football when he started as athletic director in 2011. Zenger inherited head coach Turner Gill, whose contract one Kansas booster described to me as a “$6 million hickey.” He meant, I think, that it had seemed like a good idea at the time, but Gill’s tenure had been painful from the start — his Jayhawks lost their first game 6-3 to North Dakota State. Two years into a five-year deal, with just one conference win to Gill’s name, several Kansas boosters pooled together $6 million to buy out his contract. Gill’s calamitous two-year stint coincided with the first wave of conference realignment, a process that offered great financial rewards to universities with successful football programs but offered only existential crises for many of the nation’s basketball powers. After Nebraska left the Big 12 for the Big Ten and Colorado left for the Pac-10, and with the conference’s southern football powers being courted by the SEC and an already-expanded Pac-12, Kansas and its revenue-averse football program were left with few good options. Among the best prospects reported at the time was that Kansas would take its teams, including the basketball program, to the Mountain West Conference. When Weis arrived at Kansas, he said he would stay for the duration of his five-year contract, but no more. He was here to jump-start a dead battery, not power it long-term. He has since amended that statement — perhaps with some prodding from the athletic department — noting that, in fact, he would like nothing more than to last long enough to hand the reins to his son, Charlie Jr., a student assistant for the Jayhawks. During practice, Charlie Jr., who is a 20-year-old junior at KU, is one of the few other coaches in long sleeves, a trimmer version of his father. (If Charlie Sr. is the size of a lineman, his son would struggle to fill the punter’s shoulder pads.) Charlie Jr. is seen as an extension of his father’s brain, with the best understanding of Weis’s complicated offense, and in spring practice Charlie Jr. would often stop drills to help players figure out how to run Weis’s schemes. One KU assistant told Weis that his son could be a position coach at the Division I level right now, while Weis said an NFL team had called in the offseason to offer Charlie Jr. a full-time position. Both Weises have lived together off and on in Lawrence, while Weis’s other child, Hannah, who has a rare seizure disorder with autism-like symptoms, currently lives in South Bend, in a community house run by Hannah and Friends, a foundation the Weis family started to help children with developmental needs. Over the years, Weis has dedicated so much time and effort to the foundation that he once somehow convinced Belichick to stand on a stage and sing “Wanted Dead or Alive” at a fund-raiser. This article has been updated to reflect changes to the location of the backyard where the Weis family had a whiffle ball field, the number of years Weis spent following Bill Parcells around the NFL, the amount of the buyout for Turner Gill’s contract, and the nature of Hannah Weis’s disorder.